Great vendor ! So helpful and made the experience easy ! Would highly recommend sitting Pretty ! Thank you ?? 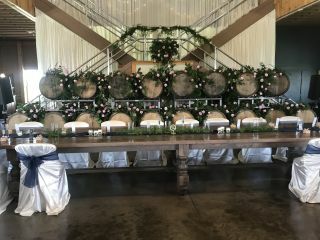 Everything that sitting pretty did for our wedding was wonderful, to the chair covers and bows for the chairs to the back drop, it looked absolutely amazing. Amanda was the most efficient vendor I worked with. She communicated quickly and always was one to two steps ahead of me. She anticipated my questions and concerns which was important because I wasn’t entirely sure of what I wanted, just that I needed a backdrop for our head table and a way to section off our ceremony. Amanda offered to meet and communicate with the venue independently of me to get everything set up. I ended up going, however and was so impressed by her personality and professionalism. It was apparent to me that she cared about my wedding and helping me to achieve my perfect day even though I was only hiring them for a few small things. The backdrop effect for our sweetheart table was perfect and created the fairytale vision I hoped for. I loved working with Amanda at Sitting Pretty Linens and she never made me feel inadequate for contacting her 2 months out from the wedding date (because issues with other vendors fell through). I would highly recommend contacting them for any linen or backdrop needs. We used her for our 7/21/18 wedding at The Bertram Inn in Aurora. Sitting Pretty Linens is great. They are so helpful and easy to communicate with. The linens they provided for our wedding were absolutely beautiful (pressed perfectly). They were very easy to work with and offered suggestions. We were pleased with their professionalism. The setup went very smoothly and we were ready to go with our decorating. The quality of material was very good, we would highly recommend them. We were very pleased with their suggestions and professionalism. Set up was timely for us to finish our decorating. The backdrop they put up at the venue really set the stage for the vows. It was a pleasure working with them. Sitting Pretty Linens made our wedding day spectacular! We were very pleased with the backdrop that was created for our ceremony and the linens really tied everything together! AMAZING TO WORK WITH! HIGHLY RECOMMEND!! Working with Amanda made our daughter's wedding day perfect. The backdrop and up lighting were spectacular. When the doors were opened and you looked into the reception area, her set up just lit up the room. During our planning, Amanda was quick to respond to ANY questions we had. Not sure when we will have another opportunity to use her services again, but if we do, she will be our only call. Wonderful company to work with! Everything was set up beautiful! This was the second wedding Where Sitting Pretty provided the linens for my daughters’ weddings. Both were absolutely beautiful and captured the essence we were shooting for. They provide excellent service, great value, and we couldn’t be happier with the end results. Amanda Patton was so easy to work with. She was able to help me with my vision and advise me. She does amazing backdrops and lighting for a terrific price. I would use her again! Our wedding was everything we hoped and more! 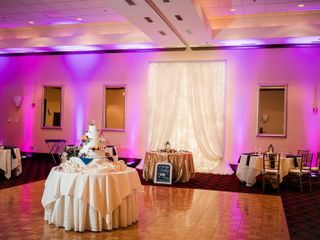 Sitting Pretty did an amazing job matching colors that we wanted, the perfect amount of lighting, and a great job with our chair covers, table runners, Saches, and so much more! We wanted our sweetheart table to really stand out from all of the rest and Sitting Pretty did not disappoint!!! And they were very reasonably priced!! We had the most wonderful experience with Sitting Pretty Linens! They went above and beyond any expectation we had, I would highly recommend using them! Their staff is friendly, prompt and great with communication. Our wedding was absolutely beautiful thanks to eveything they did! This company was so easy to work with. I rented a few select linens and chair sashes to add a touch of gold to my reception. Easy to pick up and drop off after event, even provided linen bag. Thank you for answering all my questions when I would email. Definitely will recommend to others. Thank you again! Used this company to add draping fabric to an archway for an outdoor ceremony for my daughter's wedding. They were great; came and put the fabric up the morning of the ceremony and took it down late that night after the reception was over! Our venue coordinator suggested them and they did not disappoint! The fabric added a beautiful touch to the ceremony and we loved it! Sitting Pretty Linens was easy to work with and seamless in providing their service! We used Sitting Pretty for my daughter's wedding. Viki was amazing to work with! The venue looked absolutely beautiful. They were easy to contact via e mail and always answered promptly. I would not hesitate to use them again and would highly recommend them. Sitting Pretty Linens was absolutely phenomenal from the customer service to the vision to the deliverable. Our wedding colors were black and pale pink. Sitting Pretty had the vision to do black table clothes and sleek black chair covers with pale pink organza overlays and chair sashes. When we walked into our reception venue, we could not believe our eyes on the beauty and perfection of each table setting. Sitting Pretty is top of the line, and our experience was amazing! 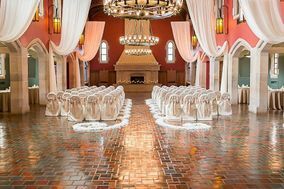 Amanda and SPL provided BEAUTIFUL backdrops, ceiling treatments, chandeliers, and linens for our wedding at Brookside Farms. She was professional every step of the way, very prompt with her email correspondences, and simply a joy to work with. Sitting Pretty Linens offers the perfect addition to help your vision come to life whether it's rustic, vintage, glitzy, or ritzy that you have in mind. Amanda worked with me to ensure she could pull off the look I wanted and it turned out better than I could have imagined. There are other companies who may offer some similar products, but I can ensure that you won't find anyone more professional, kind, and skilled at this type of service. The professionalism and kindness made all the difference during the wedding planning process. I could not recommend SPL enough!! Sitting Pretty Linens provided excellent service, beautiful draping and just the right lighting for our wedding. We had the ceremony and reception at the Ballroom at Park Lane, and SPL was familiar with the venue. They set everything up ahead of time, tore down and removed everything themselves, and offered a discount on the lighting when we ordered both lighting and drapes from them! They made everything so easy for us, and they made the venue look magical! The pricing was great and they were very responsive to inquiries. Thank you! she helped me pick out everything.. She was amazing.. I also talked with Vicky in the office many times and she could not have been more helpful, she was great to work with. They went out of there way to order a tablecloth they did not carry. I am definitely going to be using them again !!! They were Awesome !! Best service and best rates! Could not have asked for better! Would highly recommend to anyone. Everyone I worked with at Sitting Pretty Linens made my wedding planning so much easier! I literally just needed to tell them what I wanted and they did the rest. They also did some tearing down of a ceremony backdrop to add to our reception backdrop without us even knowing they were there. Amanda and Viki were the 2 I worked with and they were super helpful and responsive. I would highly recommend them for any rental needs especially for a wedding because they will take care of so much for you! We used sitting pretty linens to provide a backdrop for our ceremony to cover up some band equipment! The cover up was GORGEOUS exactly as pictured and the team that set it up was professional and flexible!! Definitely would be highly reccomended.